Zhang Gong Qi can put up to five cards in front of his character card from his hand. These are Rice. Other characters can ask for a particular Rice. Zhang Gong Qi's can then allow them to put it into their hand. During his turn, Zhang Gong Qi can put all the Rice into his hand. 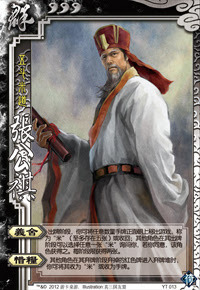 When other characters discard red cards in their discard phases, Zhang Gong Qi can place them in his hand or make them Rice. Zhang Gong Qi can recall and replace the cards he has as Rice as often as he likes during his turn. Other players can only request Zhang Gong Qi's Rice cards during their turn. They may also request and recieve more than one of the Rice. Zhang Gong Qi can have at most five Rice at any time. If he has five Rice and another player discards red cards, Zhang Gong Qi will have to put them in his hand if he wants them. If a player discards more red cards than Zhang Gong Qi could make as Rice, Zhang Gong Qi must then take all the cards into his hand. He cannot split a player's discard between his Rice and his hand. Zhang Gong Qi does not have to take red cards that are discarded. He can decide to not take them. He must take all the red cards that someone discard if he wants any of them. Rice cards cannot be targeted with Breaks or Steals, but they also cannot be accessible by Zhang Gong Qi outside his turn. It is possible that Zhang Gong Qi could die with five Peaches as Rice.